"I think children need less convincing of the importance of story than do adults. To be an adult has come to mean to be adulterated with rationalist explanations, and to shun such childishness as we find in fairy stories.…Childhood tends to mean wonder, imagination, creative spontaneity, while adulthood, the loss of these perspectives. So the first task, as I see it, is re-storying the adult—the teacher, and the parent and the grandparent—in order to restore the imagination, the primary place of consciousness in each of us, regardless of age." "The basic division among humans is between those who hope and those who accept the unjust status quo." "To be open to knowing, there are certain kinds of things one must know which most people don’t want to bother to learn and which appear boring and irrelevant.…If openness means to ‘go with the flow,’ it is necessarily an accommodation to the present. That present is so closed to doubt about so many things impeding the progress of its principles that unqualified openness to it would mean forgetting the despised alternatives to it, knowledge of which makes us aware of what is doubtful in it. True openness means closedness to all the charms that make us comfortable with the present." nor any virtue so trivial that it should be neglected." "Let us define mental health as the adjustment of human beings to the world and to each other with a maximum of effectiveness and happiness. Not just efficiency, or just contentment—or the grace of obeying the rules of the game cheerfully. It is all of these together. It is the ability to maintain an even temper, an alert intelligence, socially considerate behavior, and a happy disposition. This, I think, is a healthy mind." "How can we be so willfully blind as to look for causes in nature, when nature herself is an effect?" "The majority of people are ready to throw their aims and purposes overboard and give up at the first sign of opposition or misfortune. A few carry on despite all opposition until they attain their goal. There may be no heroic connotation to the word ‘persistence,’ but the quality is to the character of man what carbon is to steel." "Guard well your spare moment’s. They are like uncut diamonds. Discard them and their value will never be known. Improve them and they will become the brightest gems in a useful life." "You can be alert, you can create, and you can enjoy. Wake up to life! Wake up to the people in your life. Wake up to events. Wake up to your work. See, create, and enjoy. Through your attention, be a spark, a flame, a light of life. When you turn off the alarm clock in the morning, make sure you do more than just get up.…Wake up to life…and live with more awareness than ever before." Difficulties disappear under the power of persistence." "Benedicta Ward in Harlots of the Desert writes: ‘What really lies outside the ascetic life is not lust itself but despair, the proud attitude which denies the possibility of forgiveness.…It is not judgment or discussion of sins, excuses, or alleviating circumstances that break the heart, but mercy and love. Fundamental to the life of the desert fathers was the insight not to judge but to love. The ascetic’s gravest danger was always recognized to be ACEDIA—the boredom and self-pity that flourished when temptation disappeared.’"
"Don’t ever be your own worst critic. Always try to be your own best ally. There are times when it helps to acknowledge that: ‘I am aware that I am less than some people prefer me to be, but most people are unaware that I am so much more than what they see.’"
"If you wish to travel far and fast, travel light. Take off your envies, jealousies, unforgiveness, selfishness and fears." There is a legend in Greek mythology about a character named Procrustes. When Procrustes received overnight guests, he always invited them to sleep in what became known as the "Procrustean bed." But there was one condition: the guests must fit the bed perfectly. If a guest happened to be too short for the bed, Procrustes would stretch them until they fit. If another was too long for the bed, Procrustes would cut off their legs to make the person fit. From this legend is coined the term "procrusteanism." A "procrustean person" is one who has a merciless disregard for individual differences and insists, even ruthlessly, on everyone else conforming to his or her arbitrary ideas of how other persons should be. If you want to be an instrument of enmity and discord in your world, become a "procrustean person." Insist on making other people conform to your ideas of how they should be. There was once a popular TV program called "Kung Fu." One of the early episodes was about a Chinese monk walking with his favorite student in a grove of fruit trees. 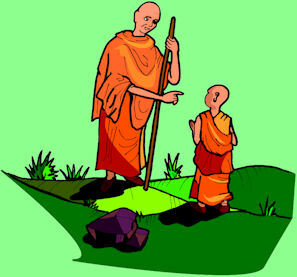 The teacher, who lost his eyesight early in life, was the "Blind Master." As they passed near a large peach tree, the teacher tilted his head in order to miss some low-hanging branches. The student noticed this in amazement and asked, "Blind Master, how is it that you saw those limbs?" The Blind Master, ever a teacher, answered, "To see with the eye is only one sensation. I hear the wind sing softly in the tree branches." The monk continued, "Close your eyes and tell me what you hear. Do you hear your own heartbeat?…Do you hear the grasshopper at your feet?" The young pupil looked down in astonishment and saw his first grasshopper of the new spring. "Teacher, how do you hear these things? The student exclaimed. "Student," the Blind Master replied, "how do you not hear them?" From that day on the teacher, always with affection, called his favorite student, "Grasshopper."